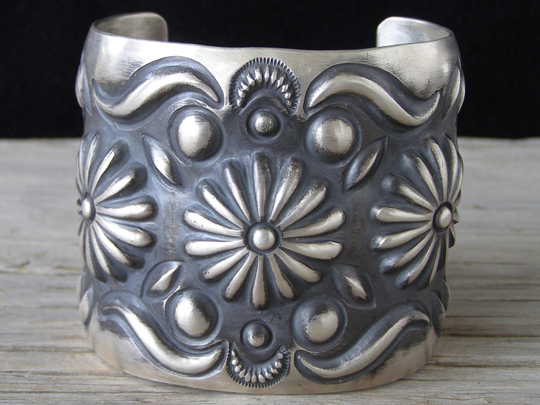 Emerson Bill Stamped Sterling Repousse� Bracelet size 7 1/4"
Made of 14-gauge Sterling sheet silver, this cuff is a gorgeous example of Navajo repousseé work. This is very old-fashioned, traditional smithing. Emerson heavily oxidized the recessed areas of the repousseé motifs and the flat areas around them to highlight the contrast. Note on sizing: Because this is fully 2 1/2" wide, it's made with a little bit larger gap to allow for a larger wrist moving up the arm from the hand. For someone who wears a size 7" bracelet in a cuff that is 1" wide, this should be about the same fit. Hallmarked Emerson in script and stamped Sterling inside. Width of cuff: 2 9/16"